Lowdown: The party of dwarves, wizard and hobbit continues on its route to the dwarves' old city and the dragon that lays there. Not a moment is wasted with The Hobbit: The Desolation of Smaug (or just Hobbit 2), as it continues straight from where its predecessor - The Hobbit: An Unexpected Journey - left off. Our heroes are straight after their last escape from the clutch of the evil orcs, and they are still on the path towards the dwarves' old city of gold in order for the dwarves to claim what is rightfully theirs. This time around they have a secret weapon, in the shape of Bilbo's ring; it does prove handy from time to time. Alas, many a danger lie awaiting our brave party. They are chased by the orcs still, and those feature a particularly gruesome new leader. They encounter elves along the way, amongst which is good old Legolas and a standout female elf whom I have never encountered before in neither book nor film. Alas, elves like dwarves and dwarves like elves as much as water likes oil. And finally, our party's destination, the gold city, is guarded by a mighty dragon, Smaug. Will our heroes be up to the challenge? No. At least not during Hobbit 2, because if ever there was a movie that lacked an ending it is this one. Hobbit 2 takes its viewers hostage, leaving us half way through a scene to force us to pay to watch the third episode. That is, if we are the type of people that seek plausible conclusions. 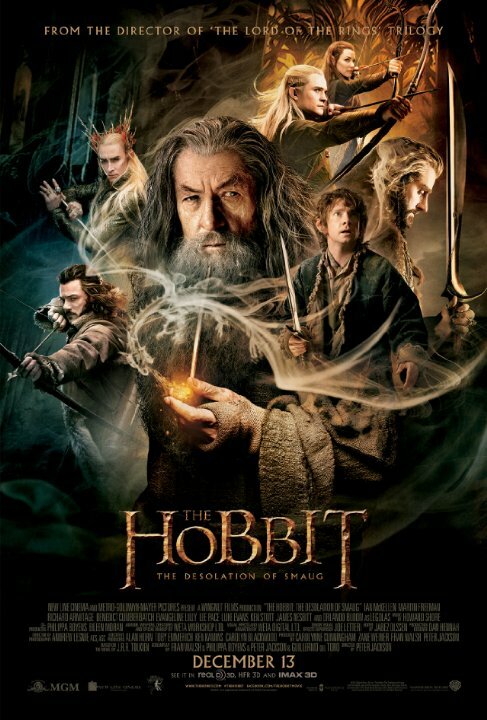 Between the start and the end of Hobbit 2, us viewers get to enjoy pretty much the same formula from the first Hobbit movie: a bit of a story followed by special effects rich action scenes, repeat many a time to create a two and a half hour long movie. This is pretty much it. As I have discussed back in Hobbit 1, there are many an enhancement to the book with which Peter Jackson & Co are trying to fill the time up. In my opinion, the bulk if not all of these enhancements detract rather than enhance the subject matter, but do feel free to argue with me. At least some of these enhancements are clearly there to serve as a link to the Lord of the Rings movies that "follow", as is clearly the case with Legolas' appearance or with the ring effects (that are absent from the book). In my opinion, Hobbit 2 is trying too hard in that department; I wish it could just relax and let go. I will concede, though, that matters are much better in Hobbit 2 than they were in Hobbit 1. This time around I enjoyed the roller coaster ride of adventures and was able to turn a blind eye to the butchering of the source material much more easily. In other words, I was entertained. Best scene: The dwarves escape the orcs by hitching a ride in some barrels as they whitewater raft an angry river, which sets the scene for a very video game, Mario like, chain of events. Overall: While better than its predecessor, Hobbit 2 is still a mediocre adventure movie without an ending. On the other hand, it is pretty entertaining over a rather long period of time, so I will give it 3 out of 5 crabs as I reserve my final judgement for the trilogy's last episode.